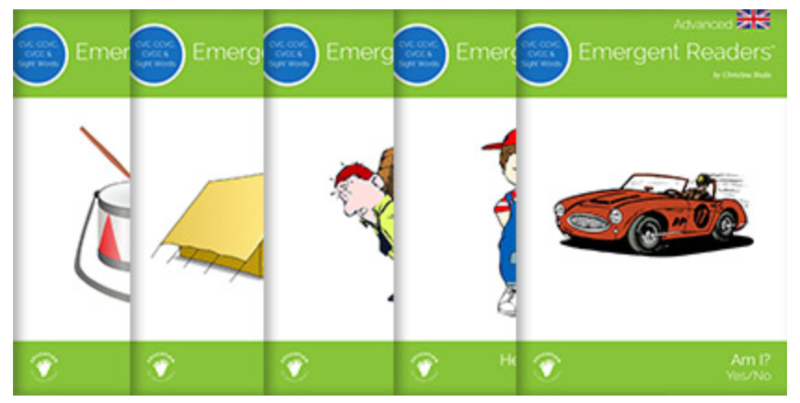 Our Emergent Readers eBooks are based on your children’s academic reading progression, and can be read independently by young readers, or as guided practice with an adult. The eBooks are a fusion of phonic, audio, and visual language learning systems, forming the ideal language platform for young readers. Our Emergent Readers eBook collection provides the building blocks of reading, launching children on a learning adventure they will never forget! Our eBooks are available in both a free online version and PDF format, and are an invaluable teaching resource for young children who are learning how to read at school or at home. Free apps and software such as Page Marker, WebPaint and Microsoft Edge will allow you to write or draw on the online eBooks while open in a web browser. Our CVC Emergent Readers are the first collection in our series of eBooks, introducing young learners to the fundamentals of reading. These consonant-vowel-consonant (CVC) eBooks introduce one or two words a page, with an audio button beside the word(s) and a picture on the facing page, making them the perfect learning model for very young readers. Beginning readers can understand the meaning of the word from the picture, while listening to the correct pronunciation, and sounding out the word(s). Our CVC eBooks are a fusion of visual, audio, and phonetic learning, making them the ideal language learning framework for early readers. Once early readers have mastered reading our CVC Word series of eBooks they can progress to the CVC & Sight Words Emergent Readers collection, where eBooks progress from 2 words to full sentences. Sight words are words that appear frequently in texts, words like “and, am, see, one, the, it, is, I, he, she, we, my,” and many more. Young readers find it difficult to sound many of these words out, so they have to learn how to recognize them by sight. There are about 100 sight words in the English language, and when children identify them by sight they can read much more fluently and fluidly. Memorizing sight words as a whole, by sight, gives young readers the key to structured reading, making it easier for them to focus on learning how to read other words in a sentence. Beginning readers can comprehend syntax and understand new words more easily and rapidly when they can recognize and identify sight words. Our eBooks display words with an audio button on one page and a picture on the facing page, giving young readers a comprehensive reading experience. The audio button allows young readers to hear the words read together, and they can also click on individual words to hear them read separately. Early readers are introduced to a consonant-consonant-vowel-consonant combination in our CCVC Emergent Readers, the third set in our series of eBooks for young readers. The double consonant blends and digraphs in the words give beginning readers the practice they need reading four letter words that begin with consonant clusters, and helps children who are learning how to read build their vocabulary. Our CCVC eBooks show a word or two on each page plus an audio button, and an illustration representing the word faces the word(s) page. This reading framework is ideal for young readers as they can listen to the word being read out loud, teaching them how to read the word properly, while they look at a pictorial representation of the word. These eBooks and can be viewed as flipbooks or flashcards, giving children who are learning how to read the opportunity to reinforce their vocabulary building and reading skills. Shala Books CVC, CCVC & Sight Words eBooks take beginning readers on a new reading adventure, where they can read whole sentences and learn new vocabulary. 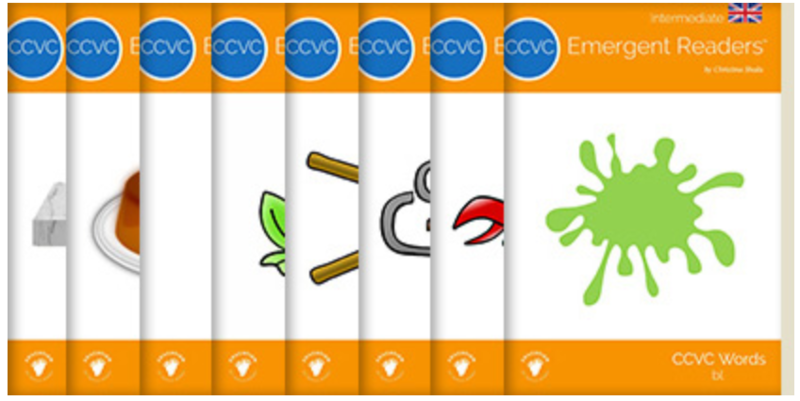 eBooks in this collection combine CVC & CCVC words with sight words, so that young readers can practice reading everything they have learned in our Emergent Readers progression of eBooks. Early readers practice reading two word eBooks in this collection and then progress to whole sentences. Early readers learn about sentence structures, recognizing sight words and understanding where they belong in a sentence; they also learn how to build their own sentences. New readers enjoy clicking on the audio button beside the words to hear them; they can also click on each word to listen to it singly. Our CVCC Emergent Readers are the fifth set in our series of eBooks for children; here young readers are introduced to consonant-vowel-consonant-consonant word patterns. Beginning readers learn how to read four letter words ending with two consonants, promoting their reading progress by offering them additional vocabulary in new word structures. Our eBooks display a CVCC (consonant-vowel-consonant-consonant) word on each page with an audio button, and a picture of the word faces this page. This is the ideal language learning platform because young readers can sound out the word while looking at the picture, engaging their visual, audio, and phonic learning skills. Young readers practice their reading and learn new words and concepts in this reading framework. The online Emergent Readers collection of eBooks are viewable as flipbooks or flashcards, allowing new readers to learn how to read in multiple ways. 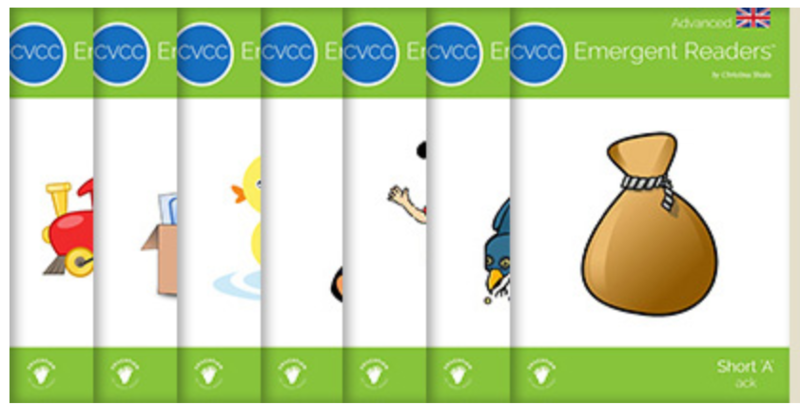 Shala Books CVC, CCVC, CVCC & Sight Words eBooks are the final set in the series. eBooks in this collection combine CVC, plural CVC, CCVC and CVCC words with sight words, so that young readers can practice reading everything they have learned in our Emergent Readers progression of eBooks. Early readers practice reading two word eBooks in this collection and then progress to whole sentences. Early readers learn about sentence structures, recognizing sight words and understanding where they belong in a sentence; they also learn how to build their own sentences.